« Eva Vergilova – and her AWESOME guitar .. Founded by Peter Lyngdorf and based in Denmark, Steinway Lyngdorf is the result of visionary ambition and uncompromising commitment. A dream shared by Steinway & Sons, makers of the world’s finest pianos for over 150 years, and Peter Lyngdorf, one of the foremost audio innovators of our time. These two icons in the field of sound share a common mission – to make us listen with all of our senses, not just with our ears. Peter Lyngdorf is responsible for some of the most significant audio breakthroughs the world has ever seen – or heard. A leader in high end audio for over 30 years, his career has been characterized by pioneering innovation, including the development of the world’s first full-range DSP room-correction device. In 1998, he gave the world the first fully digital amplifier, the Millennium. 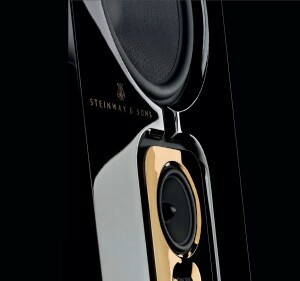 Designed and manufactured in Denmark, Steinway Lyngdorf products are for connoisseurs, for whom audio experiences are paths to the soul of the artist – the subtlest nuances and richest textures are reproduced in their purest forms through unprecedented and proprietary innovations in the technology of sound. Handcrafted artisanship has long been a hallmark of Steinway & Sons, and benefiting from a proud tradition of innovation in acoustical and product design, Steinway Lyngdorf draws from its own wellspring of gifted engineers and master craftsmen. The passion for perfection is reflected in the uncompromising look and performance of every Steinway Lyngdorf product. No cost or effort is spared. Every detail, every component exemplifies an inspired commitment to excellence. Appealing to aficionados worldwide and embodying the finest craftsmanship, the flagship Model D represents the pinnacle of Steinway Lyngdorf’s audio and design prowess. Setting the standard with our distinctive design hallmarks, it features built-in fully digital amplifiers, stunning hand-crafted panels displaying the famous Steinway & Sons piano finish and an integrated system approach. The Model D is a dipole speaker which emits sound from both front and back. Without conventional cabinets, the open-baffle speaker interacts with the room much like a musical instrument would, resulting in extremely open and life-like musicality. Elegantly constructed with fine attention to detail, its baffle is milled out of solid blocks of aluminum for unsurpassed stability. A Model D speaker takes approximately eight weeks to assemble by hand, a process which includes over 170 hours of precision machining. A Model D stereo system configuration is the perfect match of classic and contemporary design and the latest digital technology. It includes a choice between the Head Unit with an integrated CD player, or the more discreet SP-1 Stereo Processor. When paired with the P1 Surround Sound Processor, the Model D can become the foundation of a striking surround sound system. The Model C system is conceived from the same DNA as the Model D, and delivers the extraordinary Steinway Lyngdorf sound experience in its own distinctive form. Distinguished by superb craftsmanship, the Model C expresses refined aesthetics in its sleek, stylish design. The Model C compact, dipole speakers contain the same mid and high modules as the Model D. Driven by two built-in, fully digital amplifiers, the Model C speaker is paired with the powerful, freestanding Model C Boundary Woofer. A Model C system delivers compelling sound experiences in a compact form, as well as full-bodied bass reproduction, making it an ideal choice not only for music enjoyment, but also powerful home cinema experiences. Designed to match the distinctive high gloss finish of the dipole speaker, the dedicated Model C Boundary Woofer complements the Model C speaker, providing powerful and accurate bass. The proprietary RoomPerfect™ technology, ensure a seamless transition from the speakers to the Boundary Woofers. For a stunning stereo setup, the SP-1 Stereo Processor can be combined with the Model C speakers for a sleek alternative to the iconic Head Unit. Alternatively, the Model C can be used as a surround sound system when matched with the P1 Surround Sound Processor. 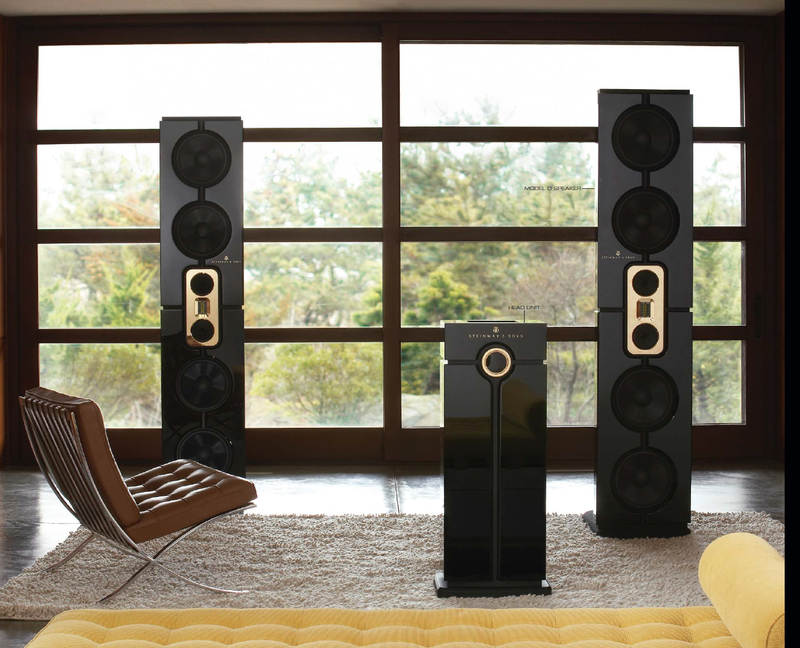 Created as an open-baffle dipole line source speaker, the Model LS Concert provides the ultimate in audio experiences. 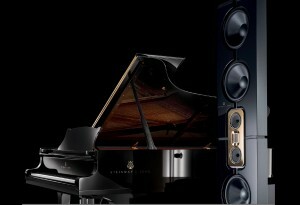 This is achieved through ingenious product design and proprietary Steinway Lyngdorf technologies. Without a conventional cabinet, the Model LS Concert open-baffle speaker interacts with the room much as a musical instrument would, resulting in extremely open and life-like musicality. At the same time the line source construction allows sound to propagate over long distances. In practice, it is almost impossible to detect any change in volume level and audio quality from the front to the rear of the room. Every Steinway Lyngdorf system benefits from the combination of proprietary RoomPerfect™ technology and fully digital amplification allowing pure sound to be realized perfectly in acoustically imperfect real-world environments. The Model LS Concert speakers can be part of an immensely powerful stereo or surround sound system by combining them with the Steinway Lyngdorf range of sound processors, amplifiers and other speaker collections. “The Model LS Concert started out as a sketch in my notebook and was something I dreamt about creating for several years. The idea of combining a dipole speaker with the line source principle would allow me to create not only a truly unique and immensely powerful speaker, but something that aesthetically fills the room with its physical presence”. 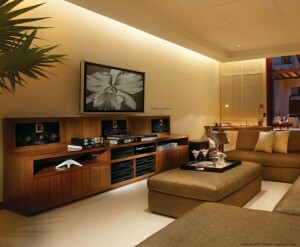 The Model LS is one of the most powerful home theater systems on the market. Powerful, flexible, and characterized by tremendous acoustical depth and realism, it has unmatched dynamic range. The Model LS suits all listening environments and is an ideal choice for anyone seeking a fully immersive audio experience. The series features an innovative line source approach incorporating floor-to-ceiling stackable speakers and Model LS Boundary Woofer modules. The Model LS can easily be expanded to suit the size of the room and the desired impact, accommodating everything from typical residential home theaters to commercial cinemas. As a Model LS line source system consists of many drivers, the load on each driver is consequently much lower than it would be if one conventional point source was required to deliver the same sound pressure. This not only improves clarity drastically, it makes power compression non-existent. As the individual drivers operate far below their power limit, dynamic headroom is retained, even at extremely high sound pressure levels. The result is a cinema system that provides incredible realism for movies as easily as it brings live concerts into your home. The model M is discrete and astonishing. Tailored precisely to your décor without sacrificing astonishingly dynamic sound, the Model M sound system puts personalized sound enjoyment soundly in your hands. The Model M not only emanates style and substance in equal measure, it guarantees powerful and true-to-life audio performance, both in stereo and surround sound system. The Model M offers a myriad of installation options, with slim and stylish speakers that can be mounted on-wall, in-wall, in-ceiling, partially or completely concealed. This discreet range offers maximum versatility to build your dream sound system in any room size, from large home theaters to compact listening rooms. In addition to the signature high-gloss black finish and a wide range of custom high-gloss color finishes, the Model M is also available in matte black which is ideal for home theater use. The In-Wall series provides invisible high performance. the In-Wall series speakers are specifically designed to be placed behind acoustically transparent screens and fabric panels to discreetly offer exceptional performance. The larger cabinet size, combined with highly efficient drivers, results in an overall increased sensitivity, allowing for improved dynamic headroom and sound pressure capability, while at the same time reducing power demands. in the Steinway Lyngdorf range, giving the full benefit of the outstanding performance our systems are known for. 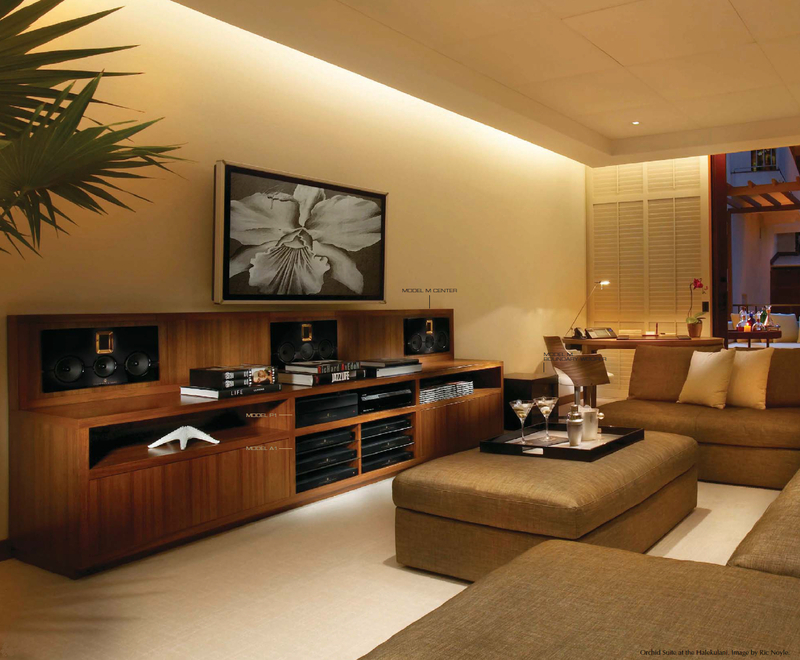 A stunningly powerful surround sound system can be built by combining the In- Wall speakers with Model LS Boundary Woofers. They can also be used as surround speakers in a Model D or Model LS system. The possibilities are endless. The S – Series, very compact in size, achieves its own unique identity while remaining true to the Steinway Lyngdorf heritage of refinement and craftsmanship. It delivers stunning, true-to-life sound despite its surprisingly compact size, – making it a winning solution where the quality of a genuine experience can’t be measured with a ruler. Tonally accurate bass is guaranteed with the powerful S-210 floor-standing dual 10” Boundary Woofers, which feature opposing drivers that virtually eliminate cabinet vibrations. The S-210 Boundary Woofers ensure powerful and very musical bass, while the compact design complements any décor. Offering soul-stirring performance, the S – Series also allows for discreet and elegant installation options from in-room to on-wall and in-ceiling. The S – Series exudes refinement and craftsmanship, whether finished in exquisite matte black or satin silver. A key feature of the aluminum cabinet S-15 speaker is the innovative patent-pending AER (Ambience Enhancing Radiation) dipole tweeter design. The result is a dispersion of the highest frequencies which achieves a spacious and ambient dipole effect, delivering concert hall-like sound in even the smallest room. A testament to audio engineering at its best, the backbone of the fully digital Model P1 surround sound processor is a true digital multi-channel signal path. It is preeminent in its field and is a demonstration of Steinway Lyngdorf’s technical prowess. High-definition audio signals are handled in full resolution without attenuation, and after RoomPerfect™ signal processing, the signal is sent directly to the fully digital amplifiers using Steinway Lyngdorf´s digital link technology. Employing the most advanced decoding technology available, the Model P1 is the first surround sound processor to process the audio signal entirely in the digital domain, and it produces the purest high definition audio experience ever achieved. For both stereo and surround sound setups, Steinway Lyngdorf offers the Model A1, a two-channel, fully digital amplifier. This powerful amplifier has a sleek design that requires only one rack unit of space, has passive cooling and the added advantage of low heat dissipation to the environment. 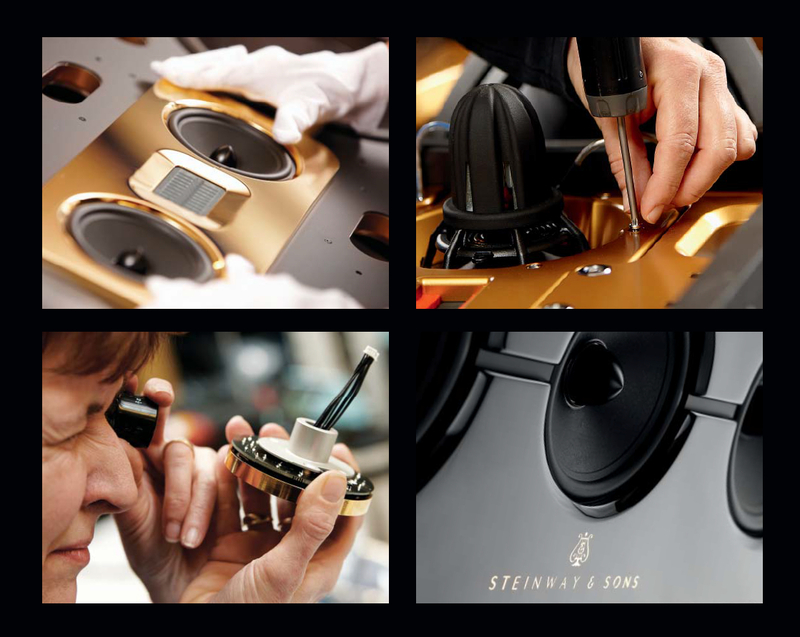 Steinway Lyngdorf´s fully digital amplifiers are unique in their construction as well as performance. There is no digital-to-analog conversion in our fully digital amplifiers. Instead, they can be regarded as a high-powered Digital-to-Analog Converter (DAC), capable of driving the speakers directly. This unique and technically demanding solution offers unsurpassed, noiseless control at all sound levels. Based on the Model P1 and sharing the same uncompromising attention to detail, the Model SP-1 stereo processor elevates musical enjoyment to new heights. Like its surround sound counterpart, the Model SP-1 includes RoomPerfect™ and features the proprietary Steinway Lyngdorf Digital Link, thus ensuring life-like audio nreproduction and full dynamic range in your system. The Model SP-1 can control all Steinway Lyngdorf stereo systems. The iconic remote control embodies Steinway Lyngdorf’s mastery of form and function while replicating the experience of the Head Unit’s volume wheel. Weighing nearly 1 kg (2.2 lbs), its rotating wheel is crafted from solid, gold-plated brass and mounted on precision-machined Swiss bearings. Not merely a powerful statement of elegance and innovation, the remote control provides intuitive and total command of your Steinway Lyngdorf system. Dedicated versions are available for pairing with stereo and surround sound systems. The distinctive volume wheel is emblematic of Steinway Lyngdorf products. Luminous and sensuous, the wheel is crafted from 1 kg (2.2 lbs) of 24-karat gold-plated brass and mounted on precision-machined Swiss bearings. Standing just over one meter in height, the Head Unit stereo processor is a testament to iconic craftsmanship and provides total control of the Model D and C stereo systems. As with other Steinway Lyngdorf processors, it handles any high-definition audio signal in its original resolution, utilizes RoomPerfect™ and features the proprietary Steinway Lyngdorf Digital Link. The Head Unit comes in the same high quality finishes and colors as the Model D and Model C speakers it is paired with.